In the 1950s the struggle between modern commercial developers and environmentalists began in Morris and Somerset Counties. In 1956, 450 acres of what is now the Great Swamp were set aside as a sanctuary. Three years later, nomination of the Great Swamp as location for a 10,000 acre jetport unleashed a deluge of public fury. The Great Swamp Committee, a citizen's alliance since revered by conservancy groups around the world, worked relentlessly to align political forces and raised about a million dollars to create the National Wildlife Refuge and first ever Refuge Wilderness Area. The Wilderness Area was designated in the eastern half of the Refuge in 1968. The limited use area provides a more primitive outdoor experience for the general public and serves as an outdoor classroom and laboratory. Tom McFadden, Outdoor Recreation Planner for the US Fish and Wildlife Service at the Great Swamp Wildlife Refuge is nearing the end of his second decade of service. He has spent as much time in the Wilderness Area as anyone else alive and was happy to answer some questions about the Wilderness Area. Nineteen years in the wilderness; that's a long time. What did you do before you began here at the Great Swamp? I grew up Lyndhurst, NJ and spent much of my time exploring the Hackensack Meadowlands. This was before the Sports Complex and the new turnpike extension went in. I remember as a youngster, seeing groups of Ringneck pheasants (10 or more) at a time was not uncommon. Screech owls, rabbits and hawks. I used to hunt rabbits along with pheasants which were plentiful at the time. I never came home empty-handed. I also had a trap line for muskrats, which were plentiful and would bring premium money for their thick fur. In the winter time we used old bed sheets as sails and ice sail down the streams that would lead to Berry's Creek. At that time the brackish water would freeze enough for us to do this. I spent every minute of my spare time exploring this area. I even had a boat there for a short time. I guess this is where I developed my love for the outdoors. While attending college, I got a seasonal ranger position at Delaware Water Gap NRA and spent the next six summers working there. After that I got a full time job at Lake Shelbyville, IL. as a Ranger for the US Army Corps of Engineer. I then transferred to the Dismal Swamp in Virginia for a short time. That was such a beautiful and lonely place. A short time later I got another position as a Law Enforcement Ranger at Independence National Historical Park in Philadelphia. I worked shifts around the clock there until I accepted a position with the US Fish & Wildlife Service at Chincoteague, Virginia. I loved working there for the next two years until I transferred to the "Great Swamp" in the summer of 1981, an area not too far from where I grew up, but never discovered until now! What is different about the Wilderness Area from the rest of the Refuge? What makes it a Wilderness? The main difference is that the Wilderness Area is a 3,660 acre piece of land that is basically left untouched as far as management goes. The Management Area, which is the remaining 3,800 acres, is intensively managed. This was the first Wilderness Area in the US Department of Interior, which was designated in 1968. It is a man-made Wilderness Area. That is, when the land was purchased, there where farms and roads there. We had to take out all the pavement, telephone poles, homes etc. and restore it to a more natural looking area to meet the requirements for a Wilderness Area. Out West you need a minimum of 5,000 acres, while in the East its substantially less. That's because there is much more open land left in the West. 3,660 acres sounds like a lot of ground. Are you familiar with every inch? Do you know it like the back of your hand? I have explored much of the wilderness but there are still areas that I haven't been. I have bushwhacked from Millington to the Chatham police department in the middle of winter when everything was frozen. That took me all day and I had to rely on a compass! I have explored some knolls that are basically inaccessible. They can only be reached when everything is frozen, and that doesn't happen often anymore. Some of these knolls have virgin Beech trees that are 4 feet in diameter. One tree that I found had a date from the 1920's carved on it. I have found old milk bottles from dairy farms in the area from the 1940's and one glass bottle of Pennzoil outboard motor oil. When was the last time you saw motor oil in a glass bottle? One time I found some old curve wire. This was a type of wire used before barbed wire was invented to keep livestock in. I believe this was from the 1800's. The Wilderness area is very dense, and the only way I was able to bushwhack was by compass. Many have gotten lost. We average about one search and rescue per year. I recommend to people today who want to explore to stay aunt 8 1/2 miles of marked trails and take a cell phone! Is there an experience in the Wilderness Area that you have had that stands out in your mind? Definitely! During February of 1993, I received a phone call from one of my Boy Scouts that he had seen a bull calf in the Great Swamp Wilderness Area. Winter is a hard time for any animal, but especially a grazing one, so I immediately began to look for it. After several attempts I found the calf about a 3/4 of a mile in the Wilderness Area. In the same general area the boy scout reported. The animals left eye was drooping badly from muscle deterioration and his ribs were showing. He was in the process of starving to death. After talking to some residents who live on the outskirts of the wilderness area I found out that in late January, the slaughter house in Green Village was unloading the calf when it decided that he did not want to become "chop meat" and jumped to freedom. It had been living on what little winter browse he could find in the Great Swamp Wilderness. To complicate matters shortly after I found him, a foot of new snow fell on the ground, making it even more difficult to uncover food. I began carrying 15 lbs. of grain, about 1 mile round trip into him after work every two days. Slowly he began to show signs of getting stronger and would now come to me when I called "Bully Bully". Bully and I became close friends as he would be waiting for me every time I brought grain into him and would come running to me when I called his name "BULLY BULLY". In the late spring, and after consuming some 400 lbs. of grain, "Bully" was growing at a fast rate. When I found him, I estimated his weight around 150 lbs.. He was now about 500 lbs. and gaining. During May an attempt to capture him by the refuge and the Humane Society of the United States was unsuccessful because I could not get Bully to cross a stream. I continued to work with Bully with the hope of capturing him later. During July I received a phone call that Bully was walking down New Vernon Road! I quickly responded and found him near Longhill Road where cars were speeding by within yards of this animal! I called to him, and he followed me to a barn in a neighbor's yard where he walked in and I quickly closed the door. I finally had Bully! Now I had to find out what to do with him. It turned out well. Bully was transported to a farm in Pennsylvania where he would be King of his own herd of Cows! From "chop meat" to "King Bull"! Bully for Him! Have you observed changes in the "citizenry" of the area? Have species come or gone? During the boom of the late 80's and early 90's thousands of new homes, condos, townhouses were built in Morris County. With this explosion around the swamp came traffic and people from urban areas who wanted more open space. The rural life style that once was found here was rapidly disappearing and is now gone. With the increase of road traffic came road kills. Not just deer but all wildlife such as salamanders, turtles etc. The ones you don't see. More complaints come in now when we have our hunt. Some people have called us and the local police crying hysterical that a hunter is walking in the woods with a gun or down the road; a scene that 20 years ago would not of gotten a second look. I believe that the entire state will some day be urban except for maybe the pine barrens. When I arrived here in 1981 there were no Eastern Coyote's or Wild Turkeys in the swamp. In January of 1988, the refuge cooperated with the NJ Division of Fish & Wildlife in allowing the state to release 22 wild turkeys they trapped in Sussex county. the birds were released in the Great Swamp Wilderness Area. These birds were once native here, but disappeared a long time ago due to eliminating their habitat, and probably hunting. The comeback has been impressive, to say the least. They are found everywhere now were there is sufficient habitat. The coyote appeared sometime shortly thereafter. They are believed to have migrated on their own from New York state. They were never introduced as some believe! They are a welcome addition to the refuge. Have you observed changes in the visitors to the area? More or less? Since 1981 the annual visitation has doubled. The Wilderness Area obviously offers something unique in our immediate area. What? Where else is there a Wilderness Area located 26 miles from the largest metropolitan area and city ( New York City). I believe there are somewhere around 40 million people within less than a day's drive. This wilderness area is truly a wilderness because it is totally surrounded by urbanization! What is a visitor likely to see on a typical day in the Wilderness Area? One thing a visitor would likely notice when visiting the Great Swamp is the abundance of wildlife. 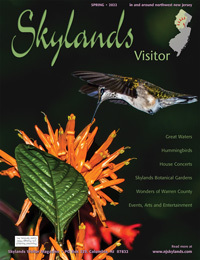 220 species of birds have been observed at Great Swamp Refuge along with man species of mammals. Visitors will also exerience solitude on a hike into the Wilderness Area. To find an escape within minutes of the population is unique. You may not see another person for some time and if you go off the trail you may never see a person. However, you're always reminded that your not far from civilization from the jets flying overhead on their way to Newark Airport. A small price to pay instead of having them land on you as was planned back in the mid 1950's to early 60's. During the migration the wilderness area is full of birds. It is a birder's paradise, if you're willing to get off the beaten path. Tell us about the bluebird in the Great Swamp. In 1976, Great Swamp Refuge began a nest box program. In the first year they had three breeding pairs of Bluebirds. Today, we have approximately 160 nest boxes and one of the largest breeding populations of Bluebirds in New Jersey. Bluebirds can be seen here all year round but summer and fall are best. Are there precautions that visitors should take when coming to the Wilderness Area? When one visits the wilderness area they should come prepared. Bring boots, as it is a swamp and, depending on the time of year, biting insects can be bothersome- including ticks. No mechanized transport of any kind is allowed in the wilderness area. Foot travel only! Do you see changes in the future management of the Wilderness Area? Is it's survival secure? The future survival of the wilderness area depends on us. The threat comes from outside the wilderness area. Continued development is a constant threat that needs to be monitored. Development increases runoff which is detrimental to the swamp. A high quality of clean water must be maintained, or the ecosystem will suffer.